24 Jan Post Service: Is Government Contracting the Right Choice? Veterans and active reservists make up a large part of our leadership team and staff. The insight and real-world experience that they bring to the table is invaluable. As an employer, we strive to make our workplace as supportive as possible for our nation’s past and present military members. 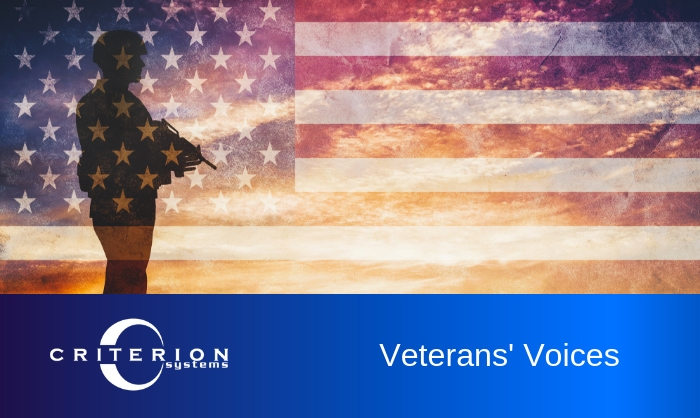 To help us gain more insight into what life is like at Criterion and within the government contracting industry, we turned directly to the source — our company’s valued veterans and active reservists. We interviewed four dedicated and accomplished members of our team. Below you will find some snapshots from our conversations and words of advice. What branch did you serve in, what was/is your position, and what time frame were you in the military? Rebecca: I was in the US Air Force and am now in the US Air Force Reserves. I’m currently a Section Chief Communications Flight. I was on active duty for 14 years and have been in the Reserves for 3.5 years now. Craig: I was in the US Army and served as a Military Policeman and Signals Intelligence Analyst/Polish Linguist Officer – Military Intelligence Officer, Counterintelligence Officer, and Information Operations Officer. I served from 1985 – 2007. Gwen: I was a Communications Officer in the US Air Force from 1984 – 1995. Thomas: I was a Cyberspace Operations Officer in the US Air Force and served from August 1989 to August 2011. As you can see from the answers above, we have a wealth of knowledge and experience on our team at Criterion. They don’t just empathize with our customers; they understand them on a much deeper level. For us, “mission driven” is more than just a familiar concept — it’s a way of life. For both Thomas and Craig, the international experience that the military provided was the most rewarding aspect of serving in the military. Being able to travel the globe and meet new people enriched their lives. Thomas: Traveling the world and experiencing different cultures. For Rebecca and Gwen, their answers were a bit more sentimental and people-centric. Rebecca: I honestly joined the Air Force because I was a very patriotic child, and it was my dream to serve in the same Air Force that my grandfather served in. Serving in defense of my friends and loved ones is by far one of my greatest accomplishments. Gwen: I loved being a leader and resolving problems. I was exposed to many aspects of communications and terrific people that were mission oriented – not so much trying to “get ahead” as trying to get things working for the warfighter. One thing rings true for all of our interviewees. Being in the military was a rewarding and worthwhile experience. Now that we’ve established the most rewarding aspect of serving, we decided to ask for their insight regarding lessons learned. What lessons learned during your services do you apply to your job now in the civilian sector? Answers to this question were all across the board. Craig: Use each and every opportunity to advance knowledge, experience, and expertise. I completed my UMUC BS Degree evenings and weekends and leveraged an Officer Candidate school appointment to transition from a blue-collar to white-collar mindset and capability. Gwen: Coming from an engineering background, the lessons I bring forward to my civilian job involve attention to detail and a methodical approach to problem solving. Thomas: Too many to count. I was in the Intelligence and Communications career fields in the Air Force. Both fields prepared me well for a great career in cybersecurity. There are many lessons learned from the Air Force that I apply when necessary to my current position. Rebecca: Oh there are so many! I would say that attention to detail, time management, and working in high pressure situations are the areas I fall back on regularly. Obviously each of these stellar employees ended up in the government contracting field and ultimately here at Criterion. We wanted to understand why they chose Government Contracting and how do they like it? Our interviewees widely agreed that it was a natural next step and complimentary to their existing skillsets. Thomas: Initially, to get my foot in the door for a GS position. After several years and hundreds of applications in USAJOBs, I decided to stick with government contracting. I’m enjoying the flexibility of a government contractor, and I have noticed in the cybersecurity field, as long as there are users behind a keyboard, my position is fairly safe. Rebecca: Having a TS clearance made it more likely for me to choose to work as a government contractor. I really like it! One of the things I like best is the mission…in government contracting I am still able to serve my country in a very direct manner. Craig: It appealed to my sense of Federal service, being retired military. I have been supporting various Federal customers since 2005, to include DOD, USAID, DOS/DS, FAA, and DOE/NNSA. Gwen: When I first got out of the military I wanted to get as far away from the military as I could. I had become certified as a massage therapist and started my own business. I also started a pet sitting business. But I quickly realized that my skills in the communications realm were more profitable and much more in demand, so I decided enter the contractor career field. Perhaps one of the hardest transitions for our nation’s military members is the transition back to civilian life. We decided to ask our in-house experts what advice would they give to someone who is about re-enter civilian life? For some, it was all about networking and leveraging who you know — both for insight and snagging a job. Thomas: Start networking now if you haven’t already. Most of the jobs I have seen my friends and co-workers land were due to networking. It’s not just what you know, but who you know. A good place to start is a professional association that aligns with the type of career you are going to pursue. For IT, I highly recommend joining the Armed Forces Communications and Electronics Association (AFCEA). AFCEA consists of military, government contractors, and federal employees. Also, make sure you have at least two types of resumes. One long resume to apply for federal jobs and a short one for civilian jobs. Take the extra time to tailor your resume for the position you are applying for. Rebecca: Find someone who got out within the past few years and latch on! There are so many questions that come up long after you have separated and who better to ask than someone who just went through it all? For others, the advice was a bit more introspective. Craig: Just like in the military, don’t shy away from positions which may be challenging as the hardest jobs are often the most rewarding. This will also enable you to continue learning, which leads to earning! Gwen: My advice to military members who are considering a transition to civilian life is to consider your medical benefits. I recommend that unless you have a very strong “life calling” outside the military that you stay in until you retire. The residual income and medical benefits will take a lot off your mind later in life.